I did this walk slightly differently to the conventional way of doing it. 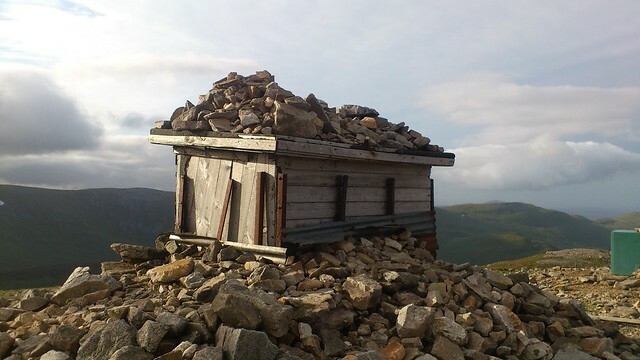 The original plan was as I finish early on Friday, go home sort myself out for work next week and go to bed for a few hours and drive up to Glenshee, this didn't happen, instead I was still wide awake at 10pm. So I went stuff it, jumped in the car and drove up. I parked up about 1am and got my head down. I woke up at 3 it being so light, I'd love to say it was the sun splitting the sky but no, it was just light. 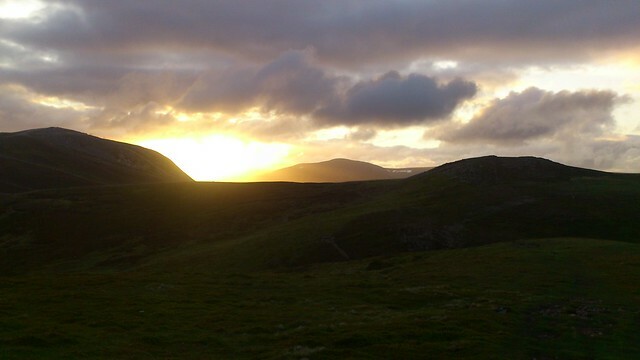 I got up got ready and I was off at 0345 with plan to try and catch the sunrise on Carn Aosda. 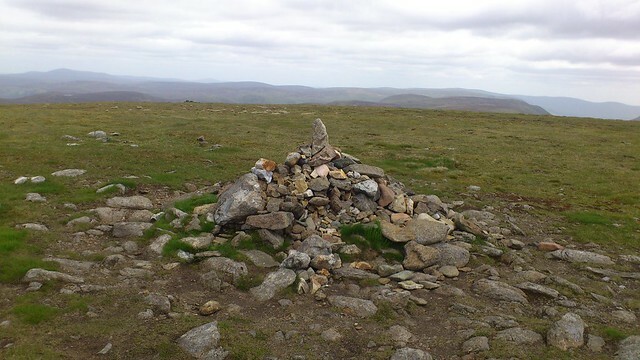 The ascent up Carn Aosda was a bit non descript, it's near on impossible to get lost, though the last wee bit is a bit steep, my achilles was having a moan but that would soon stretch out. 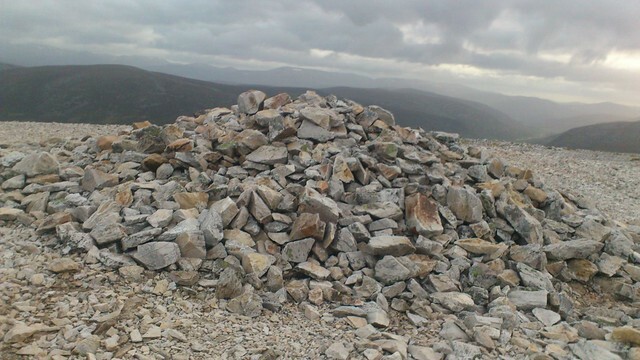 I reached the summit in 45 mins and took the usual photos and had a quick sit down. I debated whether this deserved a summit ciggie or not while I waited on the sunrise. I waited 10 mins, finished my ciggie and decided it was too cloudy to get a sunrise so I set off again. The descent to the bealach was quite pleasant despite the churned up tracks I'd seen on the ascent. I'd just swung round where Sron Na Gaoithe (I think it's that one) comes into view and there was the sun making its way up, unfortunately it didn't stop the wind which was blowing at a rate of knots and would do all day. The walk out to Carn a Gheoidh I think was the most pleasant of the day, I chose to take the lower level path on the way out and the one next to the ridge on the way back. I was making good time, it only took about an hour to walk out. 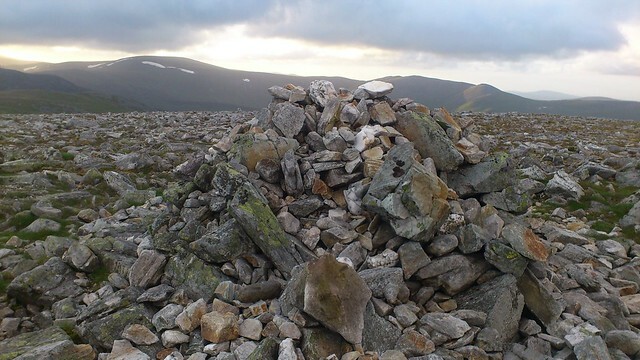 The Cairnwell was probably the most uninspiring hill I've ever done, landrover track the way up and difficult to get a photo of the Cairn with out something being in the way. The descent off The Cairnwell was steep but easy going, I scared a herd of deer away, although I'm still not sure if it was the sight of me or my heavy breathing. I hit the bottom and started the ascent up towards Glas Maol, talk about a right calf burner, this became the "Ascent Of The 50 Steps" seemed to take me forever to ascend but finally I was up, my feet didn't thank me though, I looked at the bypass pass which would take me over to Creag Leacach. 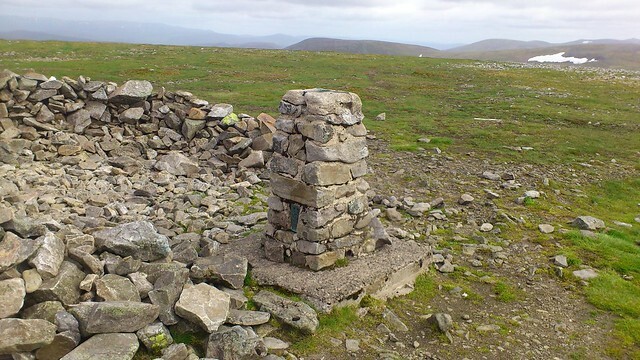 So I had a better idea, ascend to Glas Maol then walk over. The descent to Tom Buidhe was boggy but not so bad that you were easily able to pick a way through and I shortly having yet another summit ciggie and devouring more mint cake, I was on to my 2nd slab, met the same guy I had spoken to at Cairn Of Claise and we had a better chat this time round, other routes, different hills etc. The descent and ascent to reach Tolmount I think was the easiest of the day and I was up in no time, however what I hadn't realised at the time was that the ascent back up was going to be a bit of a slog. Nothing for it, head down and just go, not only were my feet having a right good go at me, I was starting develop other "issues", not long now 8 down,1 more to go, finally made it up to the Bealach that would take me to Carn An Tuirc and the finishing line was in sight. The ascent up was fine, just trying to pick a path through the ankle breaking scree and finally that was it, all 9 were done. 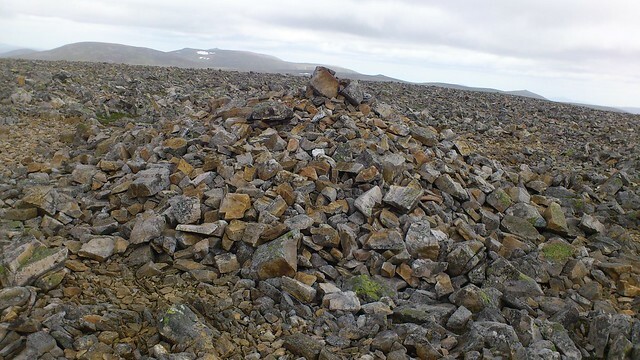 All that was left was the descent, which looked "interesting" I remember reading to head west north wesr from the Cairn, so I head over and just picked my way down trying to avoid the loose rocks where possible. Finally hit the path that would take me out, it was slow going, maybe because my body knew we were almost at the end, my feet were getting really sore, my other "issues" were getting worse but made it to the main road, where I managed to thumb a lift back to the Ski Centre. All in all it was a cracking day and the weather stayed reasonable. Last edited by Backpacker on Sat Jul 20, 2013 9:37 pm, edited 1 time in total. A fine effort, Backpacker. Maybe the route was quite unconventional, but it got you to all your targets. I, too, know all about sore feet in the Glen Shee and Braemar area! simon-b wrote: A fine effort, Backpacker. Maybe the route was quite unconventional, but it got you to all your targets. I, too, know all about sore feet in the Glen Shee and Braemar area! Weather was great yesterday, just a stiff breeze all day and seemed to strengthen when I was heading over to Creag Leacach hence why it was out the and straight back. I'm still very, very much in the Point n Shoot category and just use my phone (Sony Ericsson Experia Ray) for taking photo's, it has an auto-focus which does help. It's never going to win me any awards but does the trick for me. Believe it or not, my feet were fine this morning, maybe a wee bit tender. All I have to show for it is a small blister on my heel. 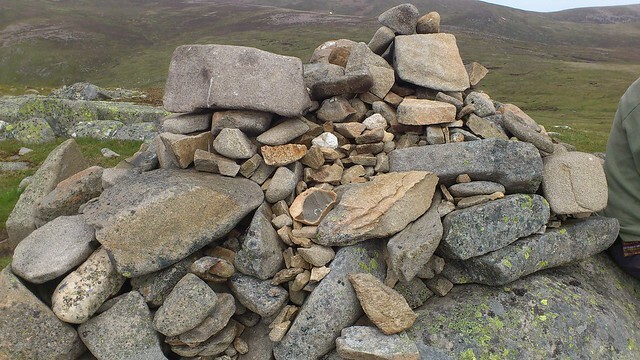 Hi Backpacker , Glad you bagged the 9 a fantastic days walking , I managed the 5 up there yesterday , was a great day . I was the walker who spoke to you as you were ready to ascend Tollmount. Reminded me of my sleepless night before setting of at 4.30 to do the 6 a few years ago. Tolmount is quite hard to place when you're looking down onto it, it's quite a distance as well! 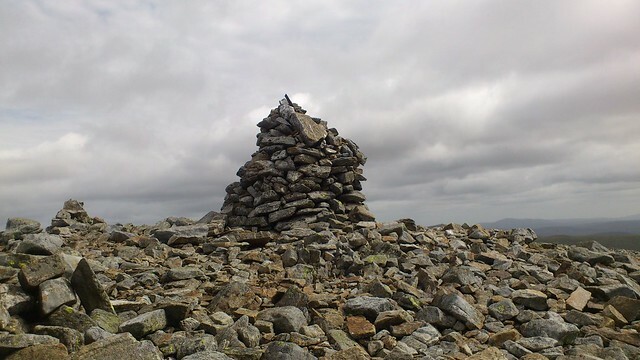 GrahamMoffat wrote: Hi Backpacker , Glad you bagged the 9 a fantastic days walking , I managed the 5 up there yesterday , was a great day .